This is a Digital Transformation tutorial offered by Simplilearn. 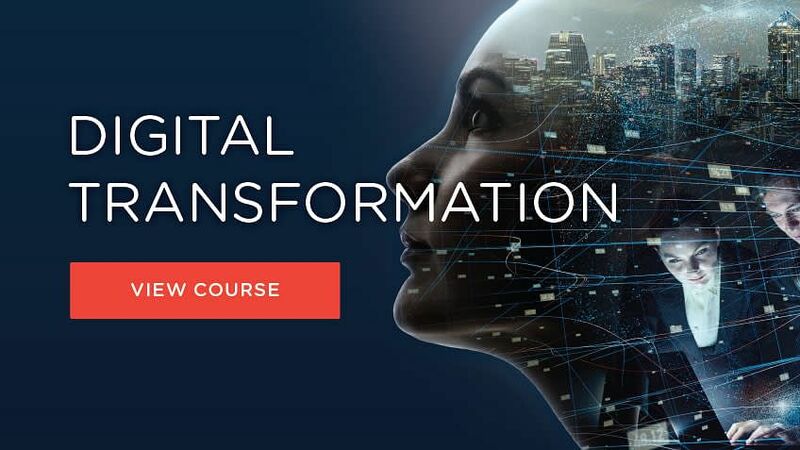 The tutorial is part of the Digital Transformation course and will help understand the basics of Digital Transformation with examples and learn the importance of adopting it in your business. Digital Transformation refers to an overall transformation of organizational activities aimed at leveraging opportunities created by digital technologies and data. This requires the company to profoundly transform its business model, infrastructure, processes, and culture, all geared toward constantly finding new sources of customer value. Let’a have look at the impact of Digital Transformation to Professionals. This transformation means a change in the outlook of the people governing the organization processes. It calls for change among executives, who play a major role in strategy development and its execution. It requires the executives to have a vision and to rethink their entire business execution process, changing everything right from manufacturing of a product to how it is marketed and serviced. Digital transformation also requires executives to shift their attention from improving existing products to adapting to new changes. This process involves integrating new business processes, practices, and information systems aligned with the goal of maintaining a good customer relationship. Digital transformation calls for change not only among executives but also among CXOs who are the representatives of an organization. Now that you have learned the changes that should be made at an individual level, let’s look at the impact of digital transformation at the Enterprise level. Becoming a digital enterprise requires far more profound changes than merely investing in the latest technologies. Let’s discuss the implications for each sector in detail. Given below are few ways by which digital transformation impacts industries. Interested to learn more about Digital Transformation? Click to know! Digital in insurance sector has changed the way people avail insurance policies. Metromile, a San Francisco-based car insurance company, offers pay-per-mile insurance and a driving app. Metromile installs a device on the vehicle. The device continuously monitors miles, sudden speed changes, jerks, collisions, etc. It works on Artificial intelligence based algorithms to improve the underwriting (assessing risk and defining premium for insurance) as it collects more data about usage. Digital adoption in the banking sector has helped in upgrading from traditional banking to an Omni-channel approach. Banks and financial operators are aggressively modernizing technology infrastructure to enable current and future growth across all business sectors. Bank of America revolutionized the banking sector through the integration of IoT in its business. It partnered with popular wearables like Apple watch and Fitbit, where a portfolio of Micro tags and Mini tags are attached to the devices. This makes the payment cash free. Customers need to just scan their smart devices to the machine installed at the shops. This makes the life of customers much easier. The digital acceptance in the healthcare sector has revolutionized the entire patient experience, right from booking an appointment to follow-up process, in a new and exciting way. Digital transformation revolutionizes the way manufacturers share and manage products. Airbus, a manufacturer of aeronautical products, is involved in the assembly of commercial jetliners. Such crafts have millions of components and tens of thousands of assembly steps, and the cost of mistakes during the process can be enormous. To tackle the complexity, Airbus launched a digital manufacturing initiative known as Factory of the Future, based on IoT, to streamline operations and bolster production capacity. Consumers are relying on digital channels and platforms for all their travel needs, from researching to booking. This has totally transformed their travel experience. Trivago specializes in Internet-related services and products in hotel and lodging. It offers travelers with a consolidated view of hotel booking options available across hundreds of travel sites. Trivago scours more than 200 booking sites to offer the best rates on more than 1.3 million properties. It also acts as an advertising platform where independent property owners can advertise alongside major online travel agencies and hotel giants using cost-per-click advertising that drives customized traffic to the websites. Digital integration has helped in improving efficiency, speed, and timing, which form the core of transport and logistics industry. FedEx introduced IoT in its supply chain model. It was faced with the problem of maintaining the quality of healthcare products while in transit. It integrated SenseAware—based on IoT technology—to keep a check on temperature, location, and vital signs of the package. This helps in making real-time decisions. For instance, if a perishable goods package sets off on a 2-day journey but the sensor data show that the shelf life has decreased, then the package can be instantly diverted to another location, which saves both time and money. Mobility, intelligent devices, big data, and business process management systems constitute the digital ecosystem through which utilities can deliver customer experience, operational efficiencies, and changing business models. RWE Power and Slock run a blockchain energy P2P sharing project. The companies are putting together a decentralized billing system for electric vehicle charging. It is called BlockCharge.Following the principle of roaming for telecommunications, it allows charging of electric vehicles anywhere (with the help of a smart plug) with a simple billing interface powered by blockchain technology. It enables the electric vehicles to interact automatically with stations and makes the electricity payment process autonomous. Digital integration has helped in creating personalized services to customers in the retail sector. Amazon, an online retail giant, is well known for its integration of technologies like IoT sensors, artificial intelligence (AI), and cameras in its brick-and-mortar stores. This eliminates checkouts. This has been made possible through the Amazon Go app, which allows customers to make purchases on their cell phones. This app-based technology uses computer vision, sensor fusion, and deep learning to provide a checkout-free shopping experience. The union of these technologies automatically keeps a track of input and output of products from the shelves and helps maintain a virtual cart. Once the customers are done with their shopping, they can leave the store. Their Amazon account is charged and a receipt is sent. This eliminates the need for waiting in the queue. The application of digital transformation across various industries gave us insights into its relevance and importance. However, for digital transformation to be successful, it needs the support of various digital advances. Let’s learn about them in detail. The digital impact on our lives is all-encompassing, whether it’s sending a message to somebody, ordering food, or booking a cab. Everything has gone digital. The change is invisible but true and is transforming people’s lives. So, what does being digital mean? Being digital is more than just having a mobile app, equipping the sales force with iPads, striving for likes on Facebook, or moving the organization’s data to the cloud. It is about creating harmony in different interrelated components at play. Executives need a framework to see how the components work together so that they can plot their own path to being digital. Digital refers to increasing the connectedness between people, processes, and products while generating insights from the information produced to create value. Digital transformation is sometimes referred to as business transformation. The value generation process through connectedness in different components calls for reexamining the entire way of doing business and exploring new frontiers of value. This may involve developing entirely new businesses in adjacent categories. The business transformation through the adoption of Digital technology has changed the entire landscape of client engagement, commerce, marketing, and more across industries. The idea that a customer can book a car anywhere and at any time in one click has transformed the idea of customized transport service at a large scale. The Uber phenomenon has set an example for changing the concept of service. The success of this application, which results from the digital revolution, is only the beginning of an inescapable transformation of the economy with tendencies of impacting professionals from all sectors. Another such example of Digital transformation is from the insurance industry: Lemonade is an Artificial Intelligence powered automated mobile insurance platform that can underwrite policies and process claims within minutes. Lemonade has been in the news for settling an insurance claim within three seconds using its claim bot, Jim. It reviews the claim, cross-references details with the original policy, and runs fraud detection algorithms. Once everything looks okay, it sends wire instructions to the bank to pay the claim. Digital Transformation is evolving at a fast pace. Companies and individuals are adapting to the change to transform their processes and create good customer experiences. Let’s now understand what digital transformation is. Keen to know more about Digital Transformation? Click for details here! Acceleration of Change – The pace of digital change is rising exponentially, making it very difficult to maintain a position of industry leadership and requiring an acceleration of new digital solutions brought to market. Digital Competition – The increasing pressure of digital competition has forced the long-established businesses to reexamine their models on the lines of new “born digital” start-ups. Customer Expectations – Customers expect a good experience across all touchpoints. It is important to ensure that their interactions are seamless and exceptional. Digital Adoption: Digital adoption of Big data, automation, and IoT has made it necessary for companies to transform completely. But, does digital just involve adopting technology? Let’s understand this. Digital is not confined to the adoption of technology. Digital requires companies to have a bonafide corporate transformation, with an emphasis on strategic innovation for the long-term and shared ownership where technology supports the process. By now, you must have understood the importance of digital transformation and how the change is the need of the hour. Where did the concept of digital transformation start? The overall history of computing has altered over the past 70 years. Computing, which was defined by the vacuum tube initially, has advanced from transistor to semiconductor to mainframe computing to mini computing to personal computing to the Internet and now to IOT in 2020. The reach has risen from 1 million to 50 billion. To use the available information better, companies have started to connect all processes and devices into networks. They have started experimenting with new digital ways of doing business, leveraging data better, and transforming to create greater agility. Now, let’s analyze who are affected by the change. Who is Digital Transformation Affecting? The evolution over the years has made it crucial to change the approach of how we meet customer needs and expectations. This calls for change at both Individual levels as well as the Enterprise level. At the Individual Level, leadership approach of both executives and CXOs needs to be altered to make way for a more dynamic, risk-taking, and lateral organization. At the Industries or enterprise level, the hierarchical approach in business to rewarding innovation irrespective of the hierarchy must change. Let’s discuss impacts Digital Transformation has on different stakeholders in an Organisation. Being digital means bringing together a number of interrelated components that increase connectedness and provide valuable insights. Digital Transformation strategy refers to an overall transformation of organizational activities, aimed at leveraging opportunities for changing digital technologies. To become a Digital Business, you require informed leaders who can create a strategy using evidence, lead teams to work, educate them to approach challenges using data-driven decision, and create constant cycles of agile and focused innovation. The key technologies disrupting the change include Data analytics, Artificial intelligence, Robotics, Cloud computing, Blockchain, IOT, and Digital marketing. There are 9 lessons covered in the Digital Transformation tutorial. The lesson names and their descriptions are listed below.